Convert Mac Outlook OLM files to PST for Windows Outlook. Supports to recover & convert all email items such as Mail messages, Contacts, Calendars, To do lists, Notes, Tasks, Folders, Posts, Appointments, Meeting request, Distribution lists, Journals, Tasks request, etc with all properties including To, Cc, Bcc, Subject, Sent/receive date and time, etc. Convert Mac Outlook OLM files to multiple file types such as MBOX, EML, EMLX, MSG, HTML, etc. Direct option to import OLM file into Office 365 and Live Exchange Server account. Export OLM contacts to vCard file type. Export OLM calendar to vCal file type. Supports to convert all types of attachments like Audio, Video, Images, PDF, PPT, Word, Excel, etc. Split OLM file into smaller parts. Message filtering option to convert OLM files from a specific date range. *Free version enables you to convert and download first 30 items from each folder of OLM file. OLM to PST converter is an efficient tool to convert Mac Outlook OLM file to PST file type for Microsoft Outlook on Windows. All data (Messages, Folders, Sub-folders, Contacts, Calendar, Tasks, Notes, Journal, etc.) will be exported in .pst file format. 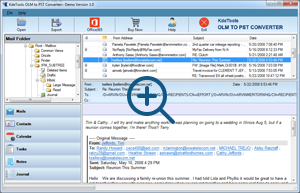 Converted file can be easily accessed in all versions Microsoft Outlook. OLM to PST converter is a multi-lingual program which supports multiple conversions such as OLM to PST, MBOX, EML, EMLX, MSG, HTML, vCard (for Contacts), vCal (for Calendar), etc. By using this application, you can easily access Mac Outlook OLM file in almost all email platforms such as Outlook, Thunderbird, Apple Mail, etc. Import OLM file to Office 365 account directly. Software gives you direct way to import Mac OLM file to Office 365 with providing option to filter messages. You can export selected messages to Office 365 account with exact Meta properties. Software is secured with Secure Socket Layer. Import OLM file to new profile of Exchange Server with the help of software. It gives you option to filter messages so that you can import only desired items. No alteration will be done by software during conversion process. Software is fully secured with SSL and easily support large sized OLM files. Extract OLM contacts to vCard file type which is globally accepted file format for contacts. All contacts properties with contact Image will be exported in vCard file type. Software supports to extract all contacts fields which are maintained by user. Export OLM calendar in vCal file type by using software. All calendar properties, events, meeting request, appointment, etc. will be maintained and exported by software. By using vCal formats, you can access OLM calendar by any device or platform. While exporting NSF files into PST, software ensure for maintaining complete folder hierarchy. This will remove all the complications related to data export. You can therefore expect maintenance of folder hierarchy. 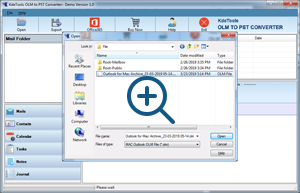 Get free preview of OLM file using its demo version which is absolutely free of cost. You can check mail messages with metadata, attachments, HTML formatting, embedded images, contact details, calendar, etc. Check screenshots or step by step software guide to convert OLM files. Step 1: Download, Install, and Run OLM to PST Converter. Step 2: Click on "Open" button to browse OLM file. Choose desired file and open. Step 3: Check preview of OLM file contents with embedded images, attachments, metadata, etc. Step 4: Click on "Export" button. A dialog box will open. 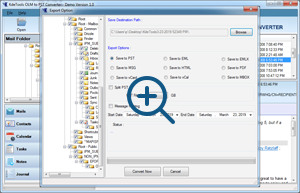 Select destination path and PST as export option. Step 5: To split resultant PST file, select checkbox named Split PST and select required size to divide OLM file equally. Step 6: To convert OLM file from a specific time period, select Message filtering option and choose required time period. 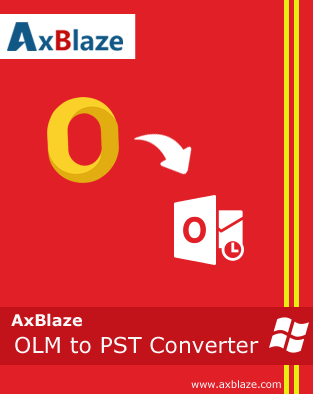 Step 7: Click on "Convert Now" button to start OLM to PST conversion process. Step 8: In short span of time, a dialog box with conversion message will appear. Click on "Office 365" button from Menu and enter Office 365 credentials. Click on "Office 365" button from Menu and select Exchange server option. Enter Exchange server credentials. *Freeware version of software enables you to open and view OLM file contents.